The excuse of not having time to exercise just got deleted permanently under a study showing all it needs is a single minute of intense activity to obtain benefits of longer regimen. Climbing the stairs at work after lunch could be an ideal and quick workout. 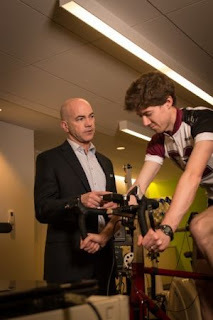 Researchers at McMaster University have shown that a workout totaling 10 minutes of intense exercise in brief bursts equals the outcomes from 45 minutes of continuous cycling in terms of cardio-respiratory fitness and insulin sensitivity. "This is a very time-efficient workout strategy," says Martin Gibala, a professor of kinesiology at McMaster and lead author on the study. "Brief bursts of intense exercise are remarkably effective." The sprint interval training (SIT) compared remarkably similar to moderate-intensity continuous training (MICT), as recommended in public health guidelines. The MICT protocol involved five times as much exercise and a five-fold greater time commitment. The SIT protocol, which involved three 20-second 'all-out' cycle sprints, included a 2-minute warm-up and 3-minute cool down, and two minutes of easy cycling for recovery between the hard sprints. The MIT group performed 45 minutes of continuous cycling at a moderate pace, plus the same warm-up and cool down. After 12 weeks of training, the results were remarkably similar in the two groups of 27 sedentary men. Gibala, who has studied interval training for more than a decade has experimented with different protocols in an effort to identify the most time-efficient exercise strategies. The WHO and the US government recommend 75 minutes per week of vigorous-intensity activity, such as running.